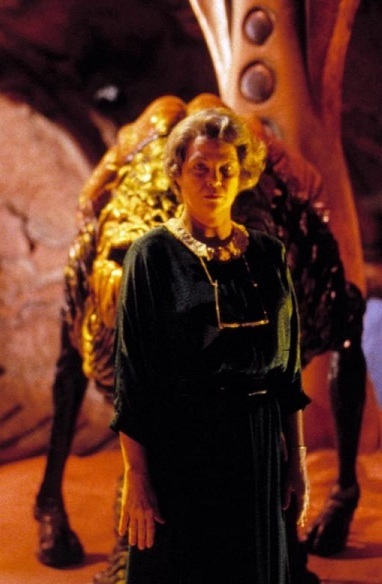 Digi-Schlock: INVADERS FROM MARS (1986) (Scream Factory Blu-Ray) – Schlockmania! In the past, Scream Factory has shown their love for director Tobe Hooper via lavish, extras-packed editions of Lifeforce and The Funhouse. 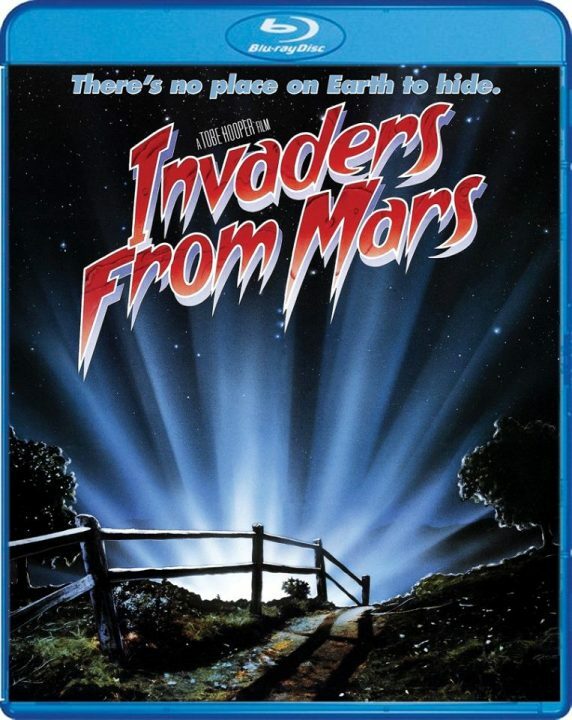 They recently revisited the director’s filmography with a new special edition release of one of his more overlooked titles, his remake of Invaders From Mars. The result is something Hooper’s diehard fans will want to invest in as it offers a big A/V upgrade and some noteworthy extras. The package begins with a handsome transfer of this title. 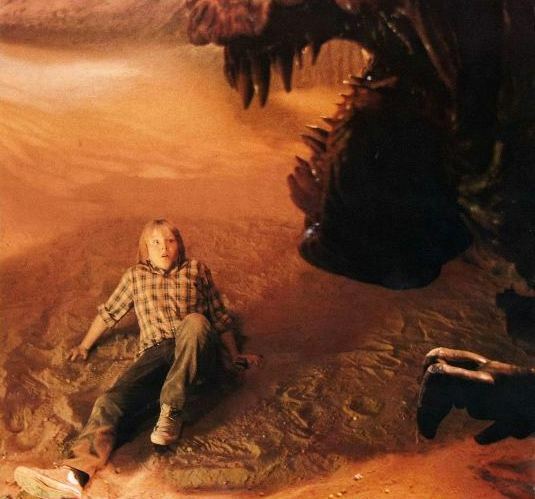 It does well by Daniel Pearl’s “Spielberg look” cinematography, offering a rich image with plenty of nicely defined details and strong colors, the latter being particularly impressive in the Martians’ lair sequences. Both 2.0 and 5.1 stereo tracks are offered, both in lossless. The 5.1 track was used for this review and its appropriately immersive, using music well and offering some nice back-channel depth during the film’s large-scale effects sequences. Extra s begin with a new commentary track that pairs Hooper with moderator/extras producer Michael Felsher. Hooper needs a bit of prompting but has plentiful stories to share once he gets started: he reveals how the project came to be, his thoughts on the different cast members and even offers a heartfelt tribute to former Cannon Films honcho Menahem Golan. Felsher makes the track a conversation, providing a steady line of questions to keep the chat going. A particularly interesting moment arrives when Hooper explains the difference between “walking films” and “running films” for a director. Next up is “The Martians Are Coming,” a 36-minute retrospective featurette produced by Felsher that includes interviews with Hooper, star Hunter Carson, composer Christopher Young and FX techs Alec Gillis and Gino Crognale. Everyone involved displays good-natured humor as they reveal how the film was a hectic but always fun production. Highlights include Crognale and Gillis telling a funny/scary tale about a last-minute complication that popped up during a big effects scene, fond tributes to Karen Black and James Karen and Young revealing how he actually wrote two scores for the film. That said, Carson might be the star of this piece, offering a stream of thoughtful and nostalgic comments that sell the viewer on the fun of making this film. Next up are a theatrical trailer and a t.v. spot for the film. Both do a good job of selling the film’s spectacle and its kid-centric tone. There is also about four and a half minutes’ worth of storyboards, all done in an appropriately comic book-ish style, and a 25-image still gallery. The latter concentrates on color stills and promotional photos but also includes a unique foreign poster design. The neatest surprise on the disc is a production illustration gallery filled with elaborate sketchers from designer Bill Stout. He also provides a commentary for this animated gallery and it’s a great listen for genre buffs. He reveals how he thought about how a Martian society would work to develop his designs, explains how he worked out a “backwards suit” design via an idea from Rick Baker to give the aliens a unique style of moving and tells a funny story about how the U.S. Marines got involved in the production. There are plenty of unused designs in this gallery, including a nifty “living spaceship” design, and Stout also offers a heartfelt tale of how working on this film rebuilt his self-confidence as a production designer. All in all, Scream Factory came up with a nice set here that allows Hooper fans to complete his “Cannon trilogy” in their high-def collections. If you admire the director’s work, it’s well worth picking up. To read Schlockmania’s film review of Invaders From Mars, click here.